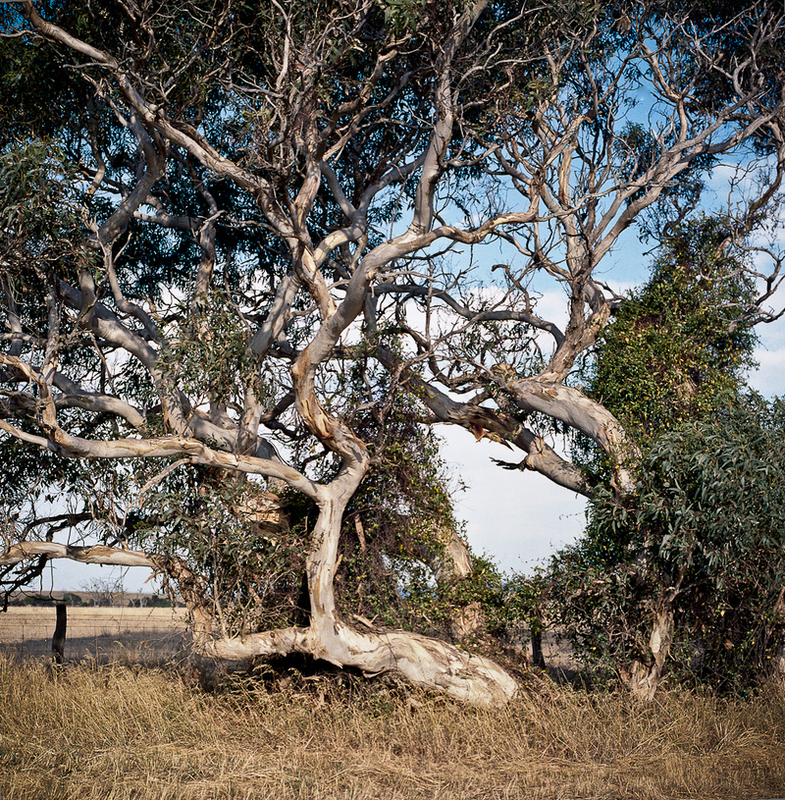 When I was down at Victor Harbor on the weekend with Suzanne and Barbara Heath I drove around some of the back roads looking for material for my conceptual photography book. I spent several hours in the car driving on dusty roads and, to my dismay, there was little roadside vegetation that was suitable. The main problem I encounted was that most of the roadside vegetation has been so cleared by the dairy farmers, that there is so little in the way of pink gums and Xanthorrhoea on the raodside for me to work with. I'm begining to think that there may not be enough material for me to be able finish the Blurb book. 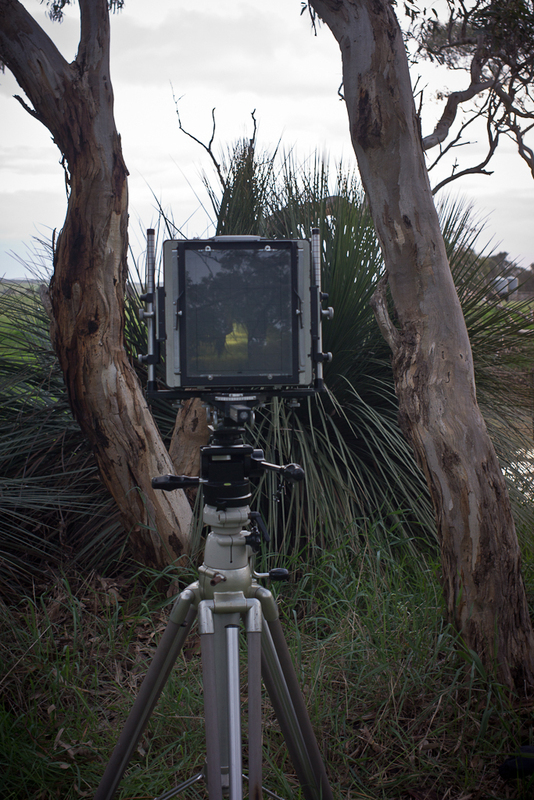 I had an early morning photographic session this morning with the 8x10 Cambo along the back country roads just west of the city of Victor Harbor. 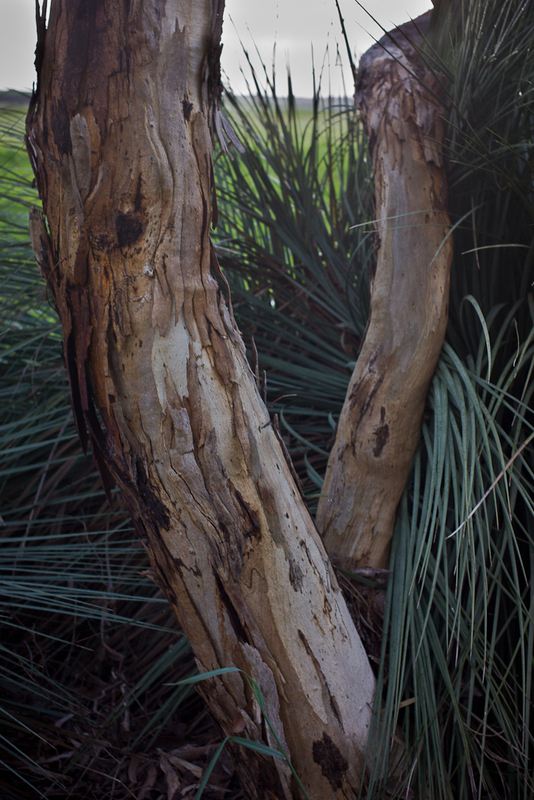 I was able to incorporate this shoot into a session for the conceptual photography project on the pink gum and Xanthorrhoea combination. The conditions were ideal--the wind had dropped, there was early morning cloud cover and sunshine. I had been been trying to photograph this scene for ages but the conditions had been against me. I had imagined it with flat light but I decided to go with the early morning sun. I used black and white film (Ilford HP5) on this shoot, but I find myself wondering what it would look like in colour. Lush I thought. Probably too lush. I do have some 8x10 Kodak colour film sitting the fridge to try out, but I am not sure how to scan the colour negative. The three days at Victor Harbor have been frustrating in terms of photography. I've been painting the lounge room of the weekender whilst waiting for the conditions to be okay for a couple large format black and white pictures of roadside vegetation. One was an early morning shoot, whilst the other was a late afternoon one. It has been frustrating because when the southerly wind wasn't blowing it has been raining early in the morning and late afternoon and then quite sunny during the day. Finally things fell into place late this afternoon after I finished painting a seciton of the wall-----there was little wind and it was overcast and fine. Ideal for the afternoon shoot that I'd lined up. 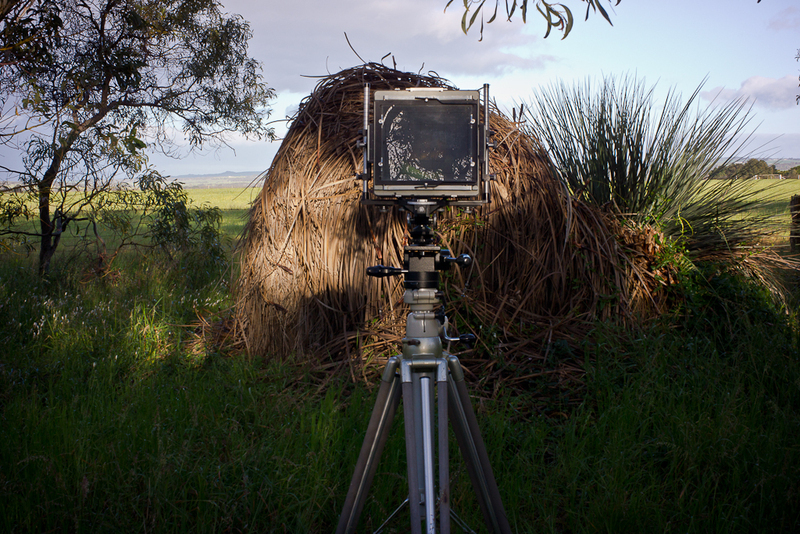 I'd forgotten just how meditative 8x10 photography is. It takes a while to set the gear up for the shoot, and that means you really are in the moment. I could feel the light changing as I tried to figure out how to use the new Pronto Professional 3 shutter for the Schneider 24mm lens that had recently been serviced. The Prontor has no T position to hold the lens wide open so you cancompose a representation of the objects in front of the camera. I finally figured out that I had to use a locked cable release to do the same function as the T positon of holding the lens open using the B position. The light was fading fast whilst I sorted things out. I've started reading Jane Hylton's The Painted Coast: Views of the Fleurieu Peninsula in order to gain a sense of the visual history of this part of South Australia from the 1840s to the present. 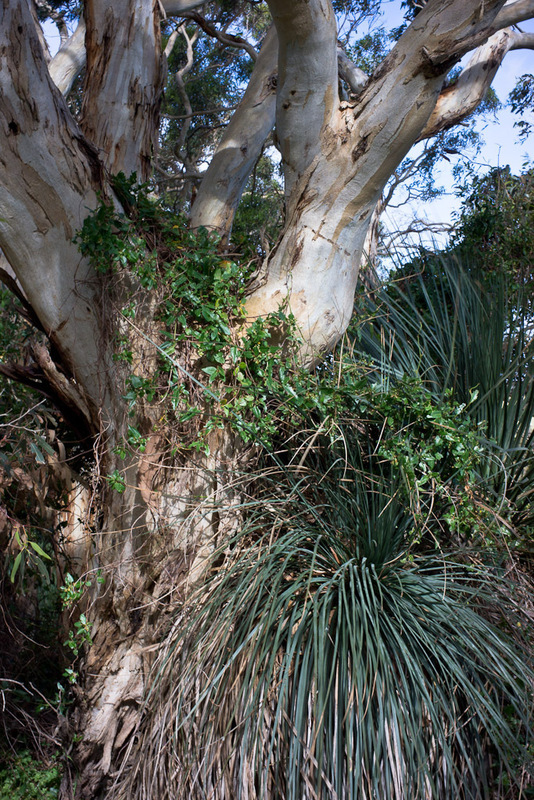 The original native vegetation, which can be seen in the early water colours of G.F. Angas and H.P. Gill, has long gone. The region is now mostly farmland. The remnants of the native vegetation outside of the conservation parks can be found along the road side. This is now pretty thin. I find the lack of native vegetation and biodiversity rather depressing.